Have you ever sat down to edit a video and the pieces weren’t fitting together? The royalty-free music you purchased won’t stretch or shrink to fit the scene? Have you ever had to compromise your vision and edit the video to accommodate the music track? Blue Mariah Pictures produces feature films, television, special effects, and commercials. It’s a Burbank operation that sometimes hires a composer and orchestra to lay down original tracks. Yet, their recent feature film “Centurion A.D.” (available on iTunes) used SmartSound for 90 percent of its music tracks. At Blue Mariah Pictures, we edit our scenes together for emotion, then discuss the musical scoring to support the dialog and drive that part of the storytelling. We go to Sonicfire Pro and type in the word that best fits that scene: Anger, frustration, happy, sad, and one I like is melancholy. 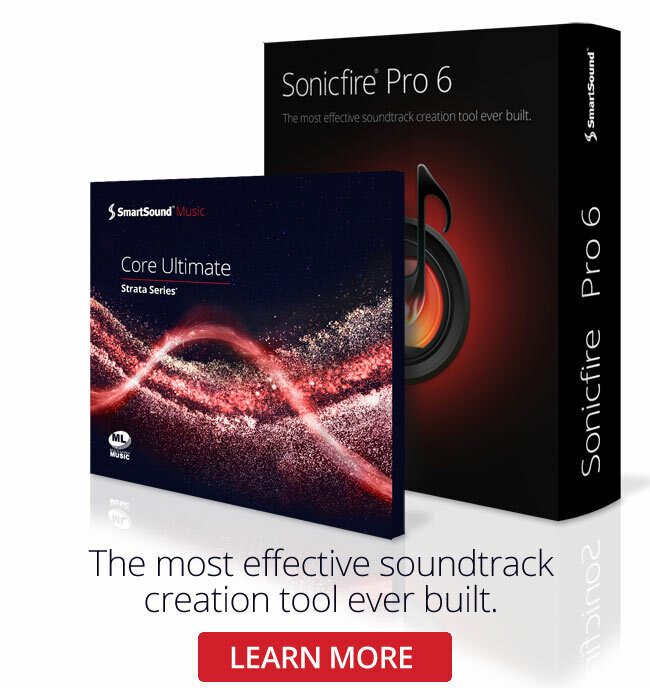 Sonicfire Pro gives us a good range of styles and tempos of royalty-free music to lay in. We type the scene length into the Sonicfire Pro preview window. Once we find music that is just about right, we retime it so it is dead on. You grab it, lay it in. “SmartSound is cheaper than paying that $100-per-hour editor to finagle music for a couple hours, only to have it sound just okay,” Reed Garvin says. One of my big concerns is pitch. Many soundtrack creation programs will raise (sharpen) a pitch when speeding up music, or drop pitch (flatten) when slowing music down. I use Sonicfire Pro to retime perfectly without altering the pitch. Use SmartSound to solve all kinds of needs for your soundtrack. If you get into a situation where nothing seems to be working musically, even sound effects, play around in Sonicfire Pro and you will find the answers. You can add or subtract instruments in most of their scores, like just having a solo instrument, base lines only, or rhythm part only. Variations on a theme are invaluable! Royalty-free music keeps your budget in check. We once considered 17 seconds of a Barry Manilow song for a project that had a $3K budget. The music really worked well for this goofy little scene. But we went to get the rights to use this music and that 17 seconds would have cost us $3,600. Sadly, we cut the scene. Don’t even think about using music you do not have rights for. I know of one guy who actually lost his house over a rights issue. Call the experts at SmartSound when you have a question about music rights or about their software. Their customer support has been a huge help in all this. It’s cool when a company like SmartSound wants to see you succeed. Read more about award winning Actor/Director Brian Reed Garvin in his 2012 In The Field article.